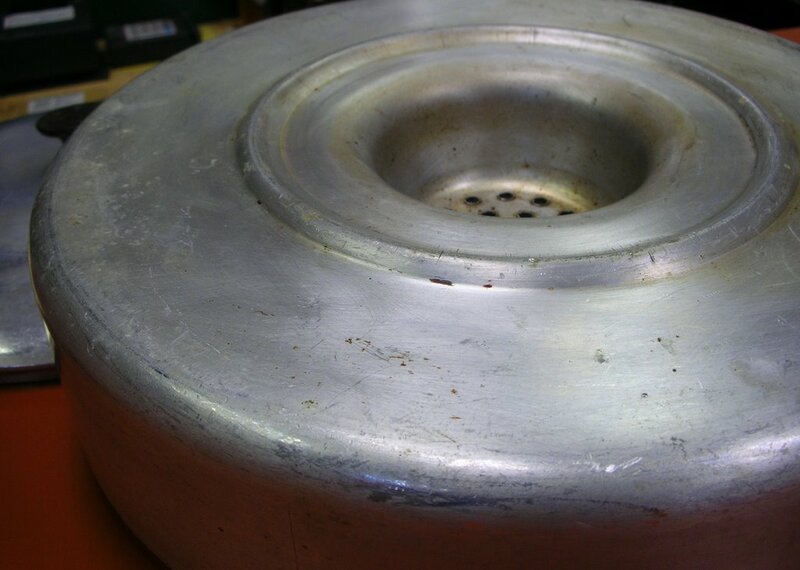 Kitchen Sleuth: What Is This Pan? 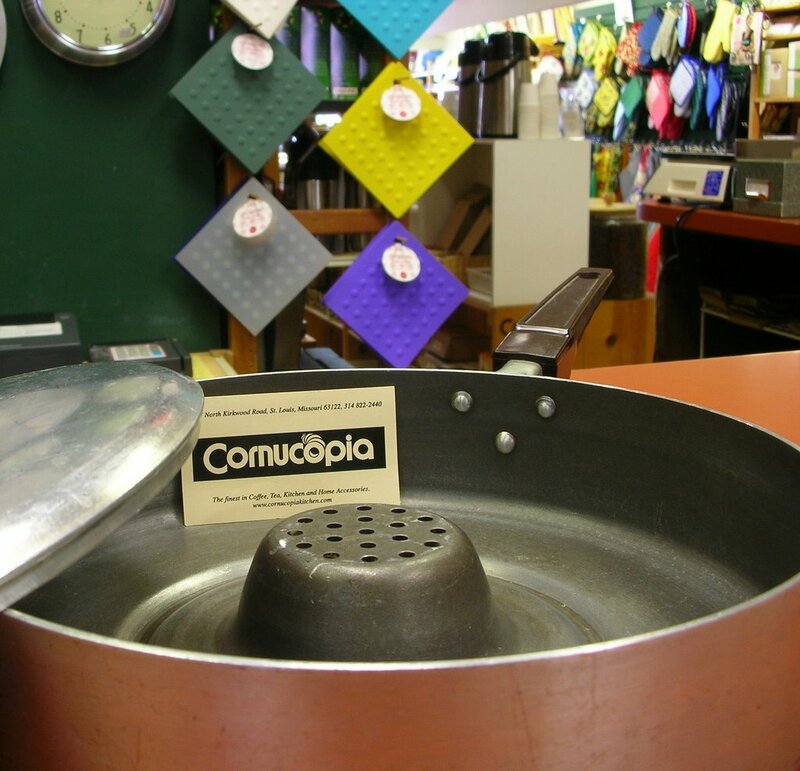 Even the good folks at my favorite kitchen shop are stumped by this pan that another customer found when cleaning out his mother's attic. It's about three inches deep and looks like a standard skillet except for the raised center with a dozen or so small holes, perhaps for steaming? The only markings are on the underside of the handle. 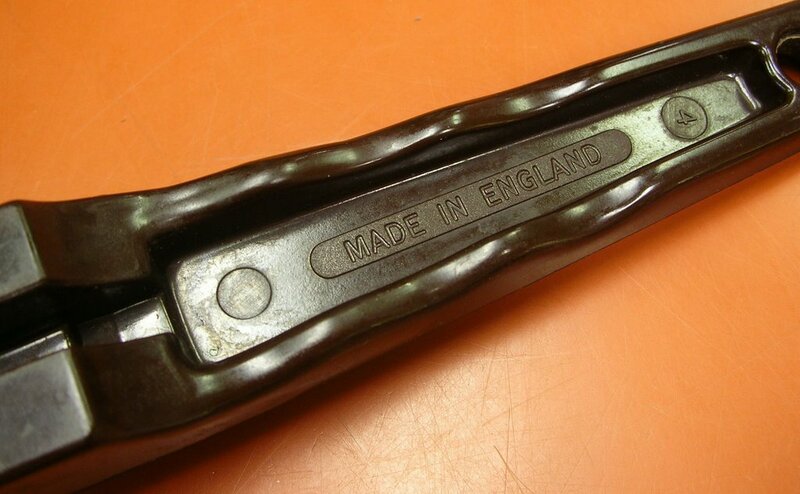 It reads "Made in England". Just to the right is a small circle with the numeral "4". There are some wear marks on the underside of the pan, as if it might fit into another pan like a double boiler. So, my foodies, What Is This Pan????? 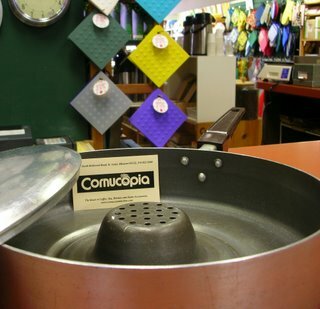 "I have never seen one of these before but I would think that it was used as a steamer. You could boil potatoes underneath and use the steam to cook broccoli on the top." It bakes like an oven, for instance to bake potatoes on the stove top without heating the whole house as heat comes up through the holes in center and dry roasts the food.Really works. I have one. "Bakes like an oven" ... it seems so obvious now! Thanks so much, Cheryle. You get the "kitchen sleuth" award!! So ... when I told the store folks what Cheryle said, the owner said, "Oh! It's a stove-top oven! My mother had one!" His mother's had no handle so he hadn't clicked. But ... when I do Google/MSN/Yahoo searches on stove-top oven, there are few references and then mostly in Mother Earth and camping circles. I did find two references on E-Bay, here and here. So I'm thinking they're really out of fashion or there's a name we haven't yet happened onto. Cheryle -- Look at this on SlashFood! I'd love to say thanks in person, if you'd like to drop me an e-mail privately! Very fun!! Way to go. The pan is from the early 70's and offered a unique way to cook with very little oil. Using just enough oil to fill the groove in the bottom you could cook some of the best "Fried Chicken" you have ever eaten. A dieter's delite. I would like to buy one, again. My mother-in-law is a thrift store shopper and always find unique finds there. She found several of these pans and gave me one. She used this pan with top to slow cook chicken pieces, very delicious (moist tender and flavorful). I tried it~~~the best. Found one of these in my kitchen hiding in a stack of seldom used pans. Had no idea what it was for nor where or how I got it. Googled "pan with raised center" and found this post. Thanks for the info. Still don't know where it came from, but at least now know what it is used for. I have one of these skillets-I LOVE IT. I bought it at an auction yrs ago. Mine is about wore out. I would like to buy another. Do you know where I can buy one.